This month, we are staying at the Anmore RV Park in British Columbia, Canada. This park is just 45 minutes out of Vancouver. And it is right next door to the beautiful Buntzen Lake. We are enjoying a whole lot of cycling in the pristine wilderness around the park. 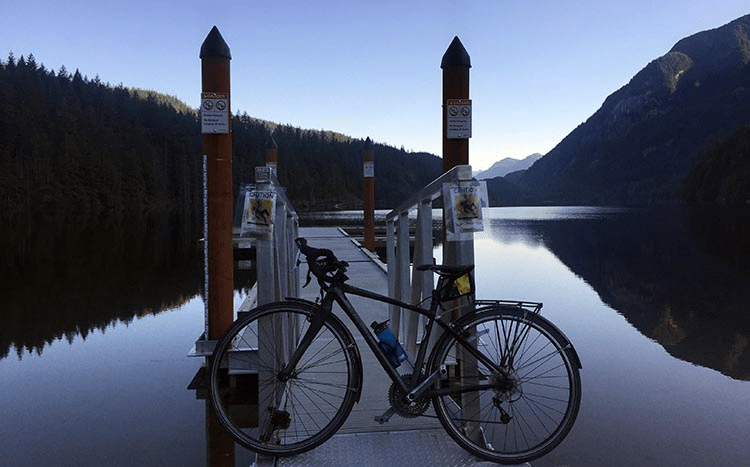 This post is about some of the cycling you can enjoy near Buntzen Lake. It is just 45 minutes (by car) out of Vancouver, but it is at a high elevation outside the city, where the air is clean. There is an attractive variety of cycling trails. Right now, we are having some very hot days – so hot that it is hard to exercise. Plus, the heat draws thousands of people to Buntzen Lake, so it is not much fun to be there over the weekend. However, we found a workaround for this – we get up at the crack of dawn and enjoy cycling in the crisp morning air, with almost no one around. Especially when we venture onto some of the restricted, gravel roads. Cycling in the early morning on restricted roads, we have the world to ourselves! 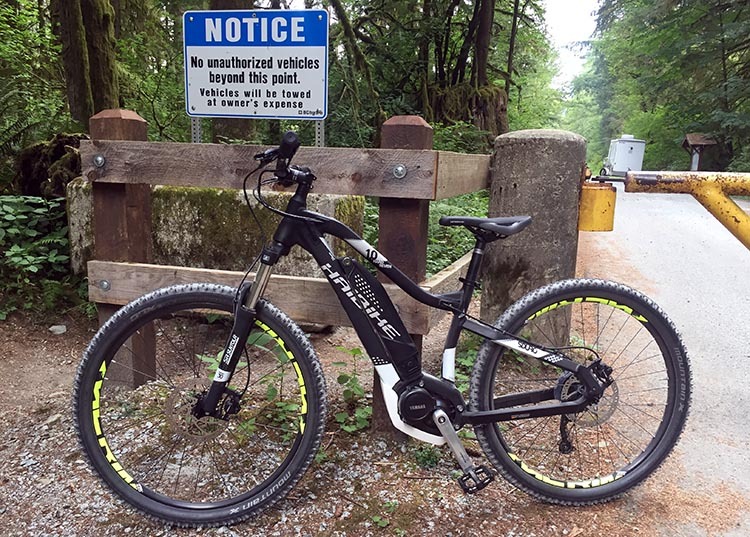 There are several mixed use trails near Buntzen Lake that are suitable for mountain biking, ranging from really easy to extremely difficult. 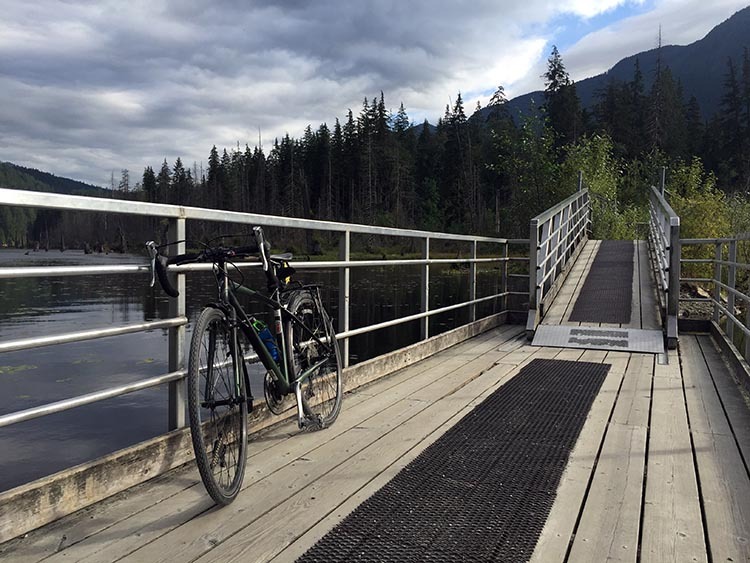 These cycling trails include Bear Claw, Saddle Ridge, Horseshoe, Lakeview, Academy, Old Buntzen Lake, and Trail Connector trails. You can find a full listing of the trails here. Note that only some of the listed trails on that site are for mixed use, i.e. hiking and cycling. Most are hiking only. One of the most popular mixed use trails goes from the gates of the park to the main recreational area, South Beach. The trail is about 3 km (1.9 miles) long, one way. This is a map of the trail. We started at the Anmore RV Park, which is just a very short distance up the road from the entrance to Buntzen Lake Park. You can find the beginning of this trail just past the gates to the park, on the right. 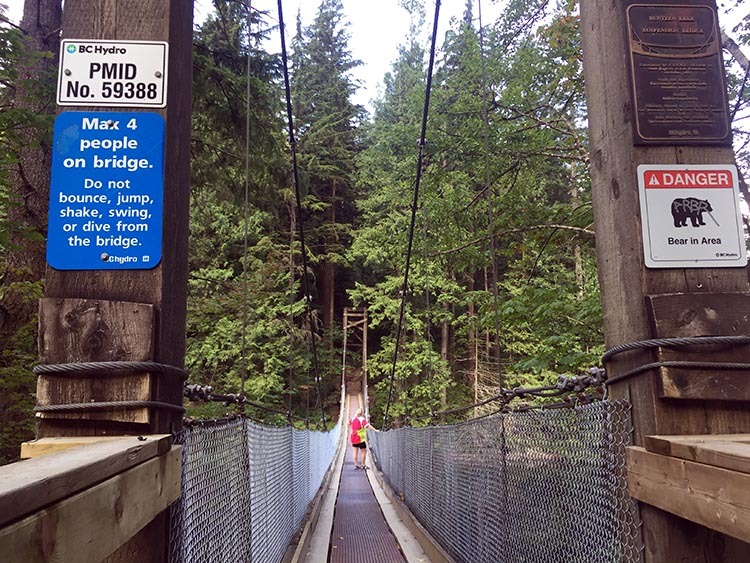 It is marked “Pedestrian access to Buntzen Lake.” On the weekend it is quite busy, but on weekdays it is very quiet. The surfaces along the way are mixed, ranging from gravel road to single trail. 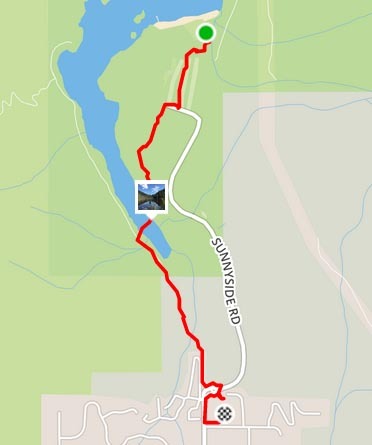 Map of the trail to Buntzen Lake from the park gates. Note that it crosses a part of the lake at one point. This is where you will find the floating bridge! The trail that goes to the beach is easy to cycle, apart from one fairly steep hill (on the way back, not on the way to the lake). And then of course, it has the advantage that it takes you to a beautiful lake! 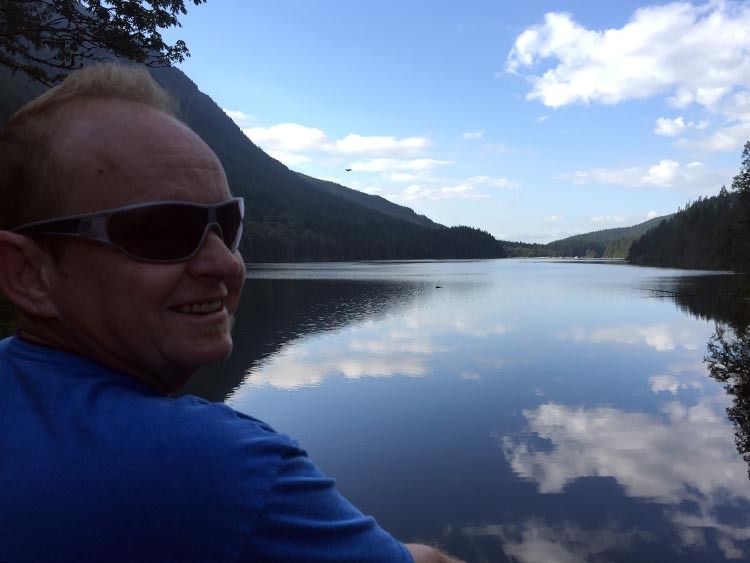 Buntzen Lake is a beautiful glacier-fed lake. At the far left side, there is a place for launching kayaks and canoes. But no motorized water vessels, so it remains quiet and pristine! 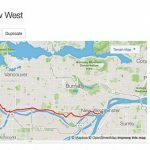 You can also bike directly down Sunnyside Road to Buntzen Lake. It’s only about 2 km (1.2 miles), but it is a little challenging. First, it is not flat. It is pretty much all hills. Heading down towards the lake you have an exhilarating downhill … but as we all know, once you go down a hill on a bike, sooner or later, you are going to be paying for that fun (when you come back)! Also, it is quite a narrow road, so on the weekend, it is only fun before the gates open to admit a seemingly endless procession of cars and trucks. This procession flows from about 8 to 10; then the parking spots full up, and the traffic stops (except for those leaving the park). We try to avoid being on that road during “rush hour,” but I must say, when we have done that ride at that time, all the drivers have been extremely careful to pass us slowly and give us a very wide berth. Because of the long, long hill coming up from the lake, we have started to use only our electric bikes to do this particular ride. Maggie got a new Haibike Sduro Hardseven because her city bike was no longer suitable for our new life – which includes a lot of camping and cycling along off-road trails. This is the cheapest Haibike available – but because it’s a Haibike, it’s still excellent. Maggie is absolutely loving it. We both love our Haibikes. 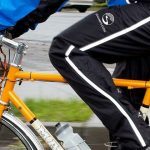 I have put thousands of miles on my Haibike Xduro Trekking (reviewed here), and it does not have so much as a scratch on it. It’ s like Bruce Willis in Unbreakable! We will be posting a review on the Haibike Sduro Hardseven soon, of course. Here’s Maggie zooming along on her new Haibike. This is one of the cycling trails that will be accessible for many cyclists. I was planning to bike the Academy Trail, but changed my mind after Maggie and I hiked it. 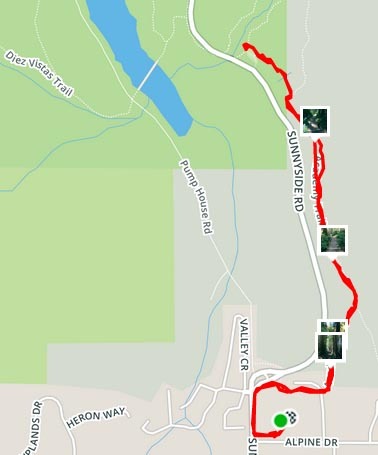 Here is a map of the hike we did along this trail. We started at Anmore RV Park. If you are not staying there, you can start it at the entrance to the Buntzen Park, just to the right of Sunnyside Road. The reason we decided not to bike the Academy Trail is simply that it is too challenging for our skill level. 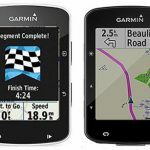 There are numerous technical challenges – such as loose gravel, loose rocks, and tree roots. If you are a skilled mountain biker, it would be a lot of fun. For the rest of us … it is a beautiful hike. The series of photos below will show you what to expect on this trail. BC Hydro maintains this area beautifully. And because BC Hydro needs to access all areas around the lake with trucks, they maintain numerous service roads. Most of these are closed off to public vehicles. However, the great thing about bikes is that there are few restrictions that can keep you out. Unlike with a car, you can just pick your bike up and lift it over a fence. Or push it through a turnstile. Or, as we have done a couple of times, slide it under a gate. Here’s Maggie getting her bike through the turnstile that gives access to the service road off Sunnyside Road. The service roads are mainly gravel, can be very steep, and often are very bumpy. However, the great thing about restricted service roads is that there are almost no cars on them! 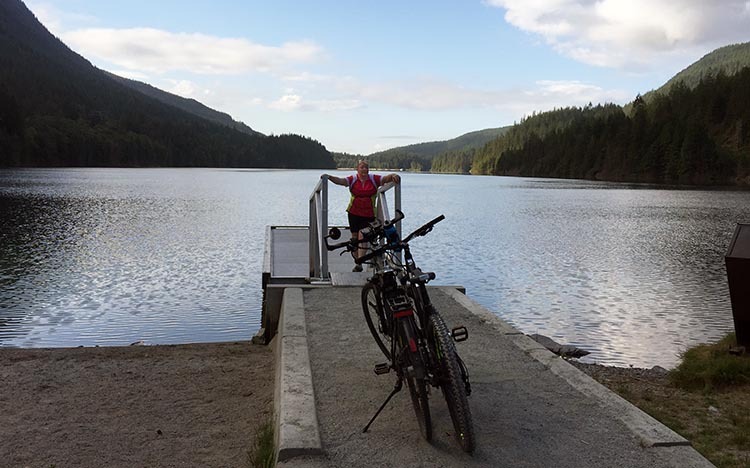 For this reason, cycling along service roads in the early morning has been the most fun we have had at Buntzen Lake. 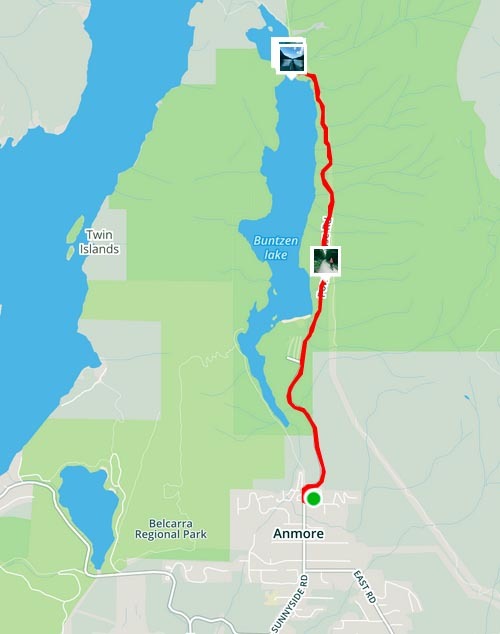 This is a bike ride we did yesterday, all the way from Anmore RV Park to North Beach. We started off on the paved road to Buntzen Lake, and then went onto the service road shown in the photo above. Once you get to North Beach, you are at an absolutely beautiful nature spot. There are a few picnic benches there, and nothing much else. No facilities at all. But a lovely, peaceful spot for swimming, fishing, or just relaxing. However, you cannot go there by car, so the only people who can picnic there are those who are willing to hike or bike all the way, or those who arrive by kayak or canoe. So, it is a lovely spot to enjoy a completely quiet and private picnic breakfast – as long as you can get there early enough! 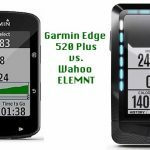 If you decide to do this bike ride, bear in mind that there are some very steep hills. The first time we did it we were on regular bikes, and we had to turn back before we reached North Beach. This time we took electric bikes. It was still a workout, especially the very steep and very long hill that you get to just after you get onto the service road. I was leaning forward onto my handlebars to ensure I did not flip over backwards! But we had a great time, and we made it to North Beach. The view of Buntzen Lake from North Beach in the early morning is awesome, with thousands of trees reflected on the lake. I took this photo from the small floating jetty. We left our bikes parked randomly on the beach. In the early morning, there is no need to worry about anyone stealing your bike. We met a few joggers and hikers, and everyone was friendly. Alternatively, a lot of people bike up Sunnyside Road to access the lake. However, that is really only for extremely fit people, or people on ebikes. Sunnyside Road to Buntzen Lake is all uphill, at times reaching 9 to 12% grades. At one point, it briefly hits 15%! 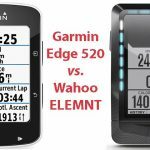 So, it is not recommended unless you are an elite athlete, or have a powerful ebike. Also, the road is narrow with no shoulder, no bike lane, and no sidewalk. 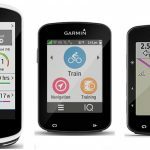 So you need to be a very skilled and confident cyclist as well. And perhaps lucky as well. 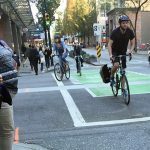 Despite it being so challenging, many cyclists do this route in the early mornings. Not so much to go to the lake, but to ride all the way up the hill, ride past the lake (perhaps stopping for a few minutes to admire the view and eat a protein bar), and then ride all the way down again. I admire them, but that ride is harder than Maggie and I like to do. Another way to get there is with the no. 182 shuttle bus from Moody Central Skytrain station. 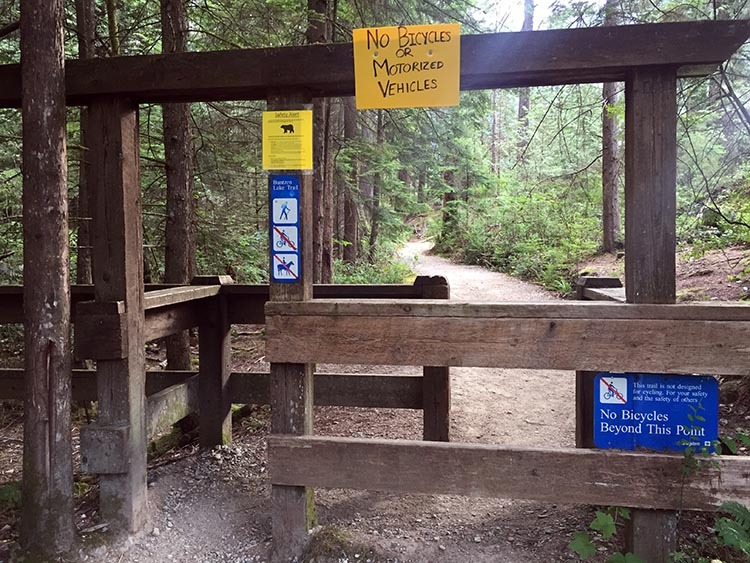 This will get you to the gates of Buntzen Lake, from which you can access the trails. These little buses will take a maximum of two bikes. They run every 30 minutes, and are very pleasant to travel in, with comfortable seats, air conditioning, and friendly drivers. There is also a no. 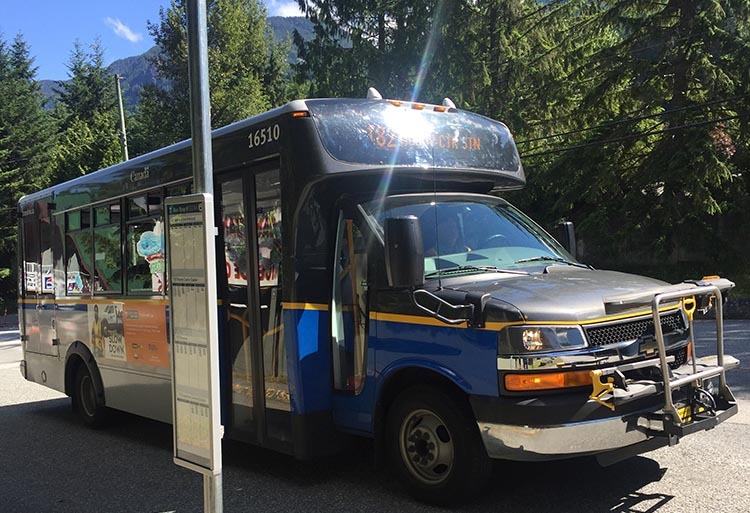 179 shuttle bus that will take you all the way to the lake itself – see Translink for schedules. You could easily spend the whole summer exploring the trails in this area on a bike, especially if you are a skilled mountain biker. 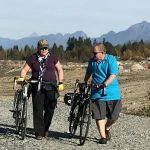 But even if you are just an average Joe Cyclist, like Maggie and I, you can have tons of fun cycling in the Buntzen Lake area. We highly recommend it!